These Aprons are attached to the warp (back) and cloth (front) beams of floor and some table looms. The warp threads are attached to these using the metal warp rod and they have been designed to be long enough to unwind around the loom breast beams to prevent the waste of warm. Made of heavy canvas, these aprons are hemmed all around to prevent fraying and have a sleeve at one side designed to fit a warp rod. Enough tacks to fasten the apron to the warp beam are provided for installation. Normally 2 aprons are required, one for each beam, except when a sectional warp beam is used. In this case, only one apron is used (on the cloth beam). Note that many smaller Leclerc looms may use beam sticks instead of aprons. 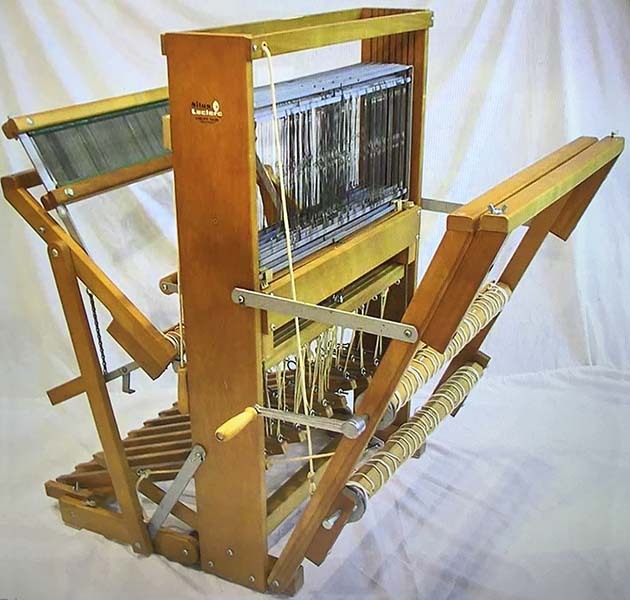 Also note that the 32 inch apron is designed for the Initiation table loom and is to short for a conventional floor loom which has a longer distance between warp and breast beam. Are you winding the warp on your loom with a wrench? If you lost the crank handle from your Leclerc Loom, we have the replacement handle from Leclerc. Made of steel with comfortable wooden handles that turn (except for 88800-0150) these Leclerc crank handles make winding your warp a breeze! 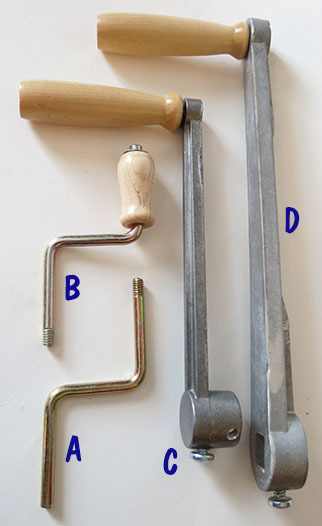 Both the Medium (C) and Large (D) Crank Handles now include a small bolt to allow the handle to be clamped to the loom. 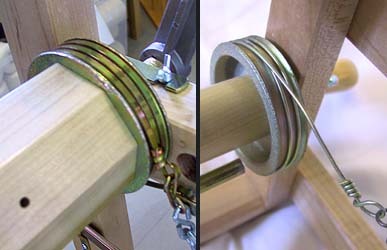 A special version of Small Crank Handle (B) with a slightly longer shaft is used on the 24" wide Voyaguer and Diana looms. Please indicate this in the order. Note: Many early models of the Artisat loom came with a large version of the handle shown as "A" in the picture above. 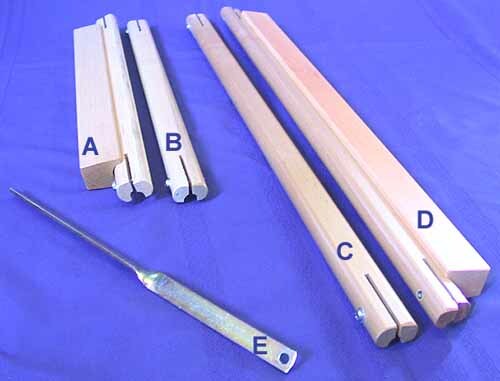 Unlike the Medium Crank Handle (shown as "C"), this handle sticks out and cannot be easily removed when storing or transporting the loom. These older looms can be converted to use the new crank handle by installing a bolt which we can provide along with the Medium crank handle. 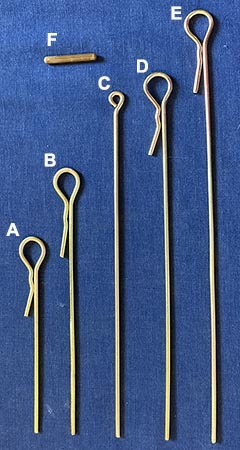 Some early Dorothy and Meco table looms came with the small all-metal crank handle (shown as "A"). These can be upgraded to the more comfortable crank handle shown as "B" in the diagram above. These coloured plastic handles fit over the steel levers on Leclerc table looms to make it easier for the weaver to press down the levers. They are colour coded red, yellow, blue and white to make it easy for the weaver to quickly select the correct shaft. 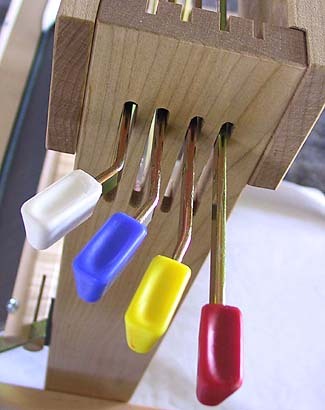 Note that these handles can only be used with looms that originally had plastic tips. 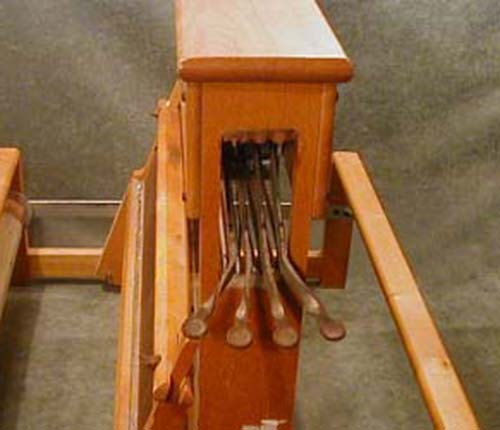 Some of the earlier Leclerc Table looms used metal levers with shaped tips instead of the plastic handles. Unfortunately these are too wide to attach these plastic tips to. 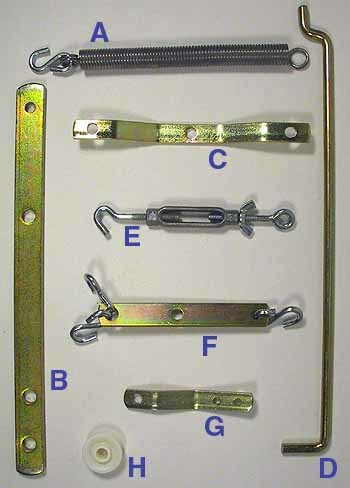 An example of these levers are shown here. 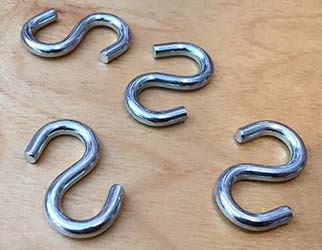 These metal hooks are used to attach the wooden treadles of Leclerc floor looms to the treadle cords which are usually connected to the lams. They slide through the metal eyelet screws at the top of the treadle and different lengths are available to match the treadle length (normally determined by the number of shafts). One is required for each treadle. These metal pieces are attached to the ends of the Cloth and Warp Beam on most Leclerc Floor Looms including the Fanny, Mira, Nilus, Nilus II, Colonial and others.They provide the "axle" that goes into the loom frame at each end and which the beams rotate on. 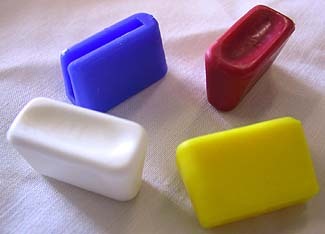 There are three separate end pieces. The Brake Drum End (A) is made of metal and is attached to the right side of the warp beam (at the back). It has a smooth round surface that the brake circle wraps around. 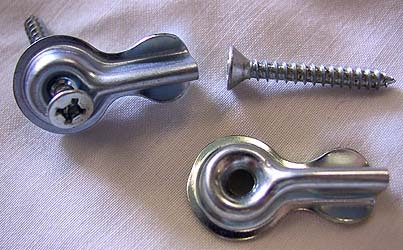 The Ratchet Wheel End (B) is made of metal and attaches to the right side of the cloth beam (at the front). 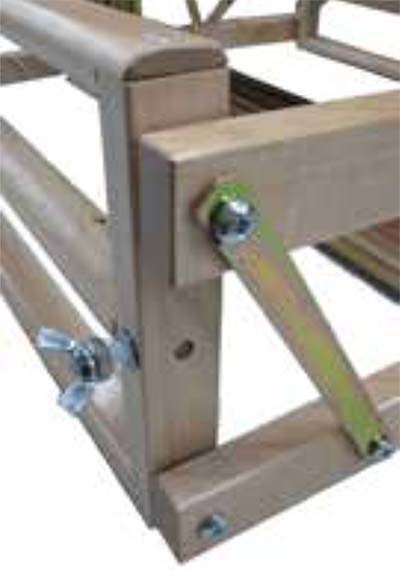 The standard Leclerc floor loom wooden beam is 4 3/4 inches in diameter. 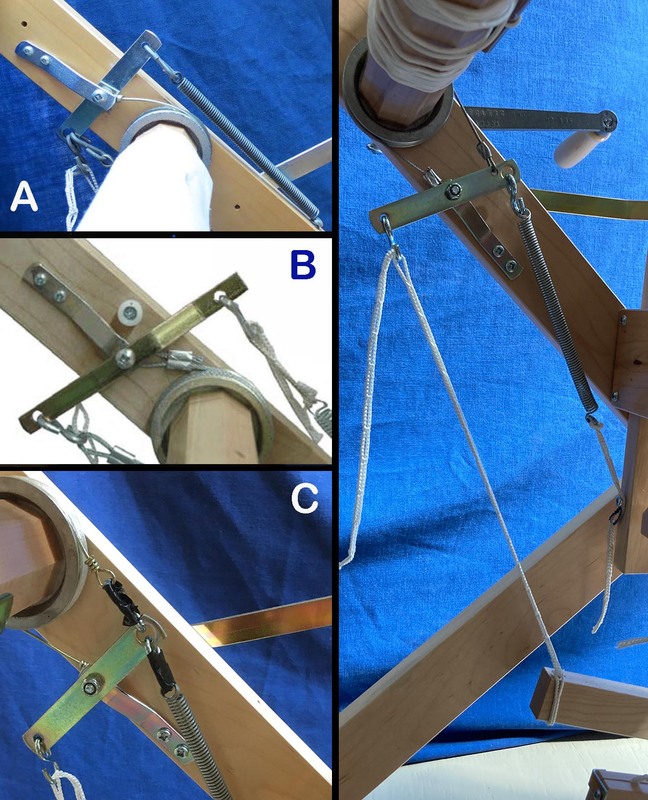 The pawls mounted to the Take-Up Handle and the loom frame hold the cloth beam from rotating using the notches in this wheel. The Plain End is used of the left side of both the Cloth and Warp Beams and simply provides the axle for the beam. 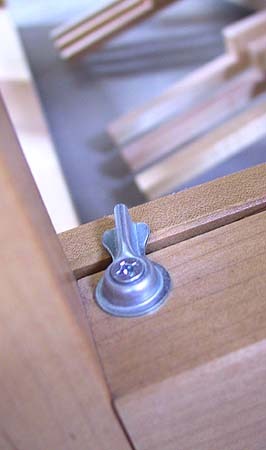 Each of the beam ends also includes the screws necessary to attach them. Parts may require the special square end screwdriver to remove the old and/or install the new part. These were included with the loom. Please ensure you have these tools before ordering to avoid installation problems. Click here for the brake drum used in the Compact and Minerva floor looms as well as the Leclerc table looms. Click Here for beam ends for the Artisat loom. Note: Complete Cloth and Warp Beams for Leclerc Floor Looms are also available. Please contact us for pricing. These metal pieces are attached to the ends of the Cloth and Warp Beam on the Leclerc Artisat floor loom. The Brake Drum End (A) is made of metal and is attached to the right side of the warp beam (at the back) and is about 4 1/4 inches in diameter. It has a smooth round surface that the large brake circle wraps around. 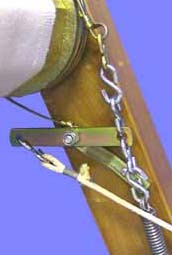 The Ratchet Wheel End (A) attaches to the right side of the cloth beam (at the front) and is about 3 1/4 inches in diameter. 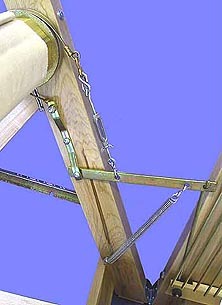 The pawls mounted to the Take-Up Handle and the loom frame hold the cloth beam from rotating using the notches in this wheel. Screws for attaching these beam ends are included and the Brake Drum also includes the bolt that threads into it through the frame that the Crank Handle attaches to. 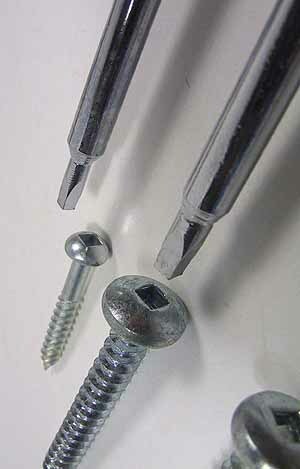 This bolt can also be ordered separately. Note: Parts may require the special square end screwdriver to remove the old and/or install the new part. Please ensure you have these tools before ordering to avoid installation problems. These metal pieces are attached to the right ends of the Cloth and Warp Beam on Leclerc Table Looms such as the Dorothy, Meco, Voyageur, Penelope and Bergere as well as floor looms like the Compact and Minerva. There are two separate ends. 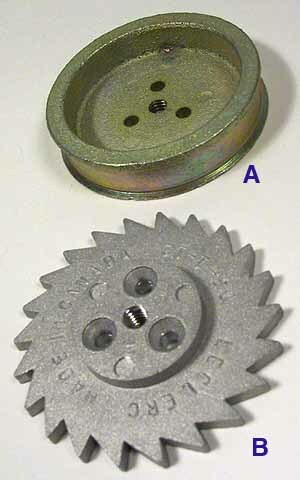 The Brake Drum End (A) is made of metal and is attached to the right side of the warp beam (at the back) of looms that utilize a friction brake. It . It has a smooth round surface that the brake circle wraps around and is about 2 3/4 inches in diameter. 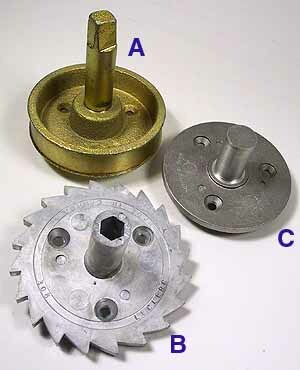 The Ratchet Wheel End (B) is made of metal and attaches to the right side of the cloth beam (at the front) as well as the warp beam (at the back) for looms that do not utilize a friction brake. 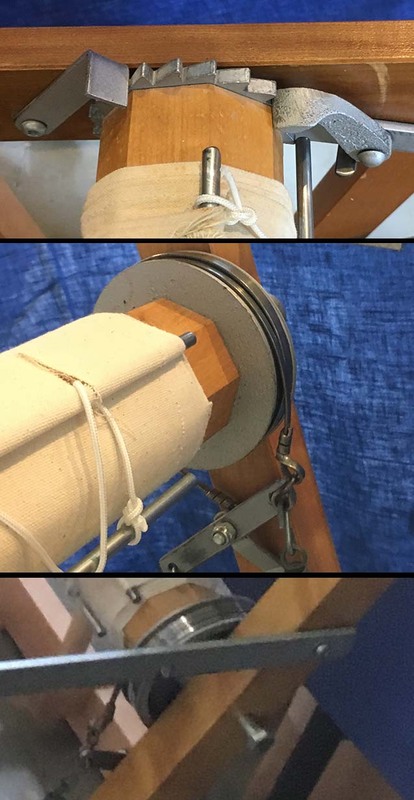 It is about 2 1/2 inches in diameter and the pawls mounted to the loom frame hold the cloth/warp beam from rotating using the notches in this wheel. The Brake Drum and Ratchet Wheels for the Table looms are threaded in the center to fit either of the two small Crank Handles. Note that the beam ends for the Compact and Minerva look similar but have a slightly different center. 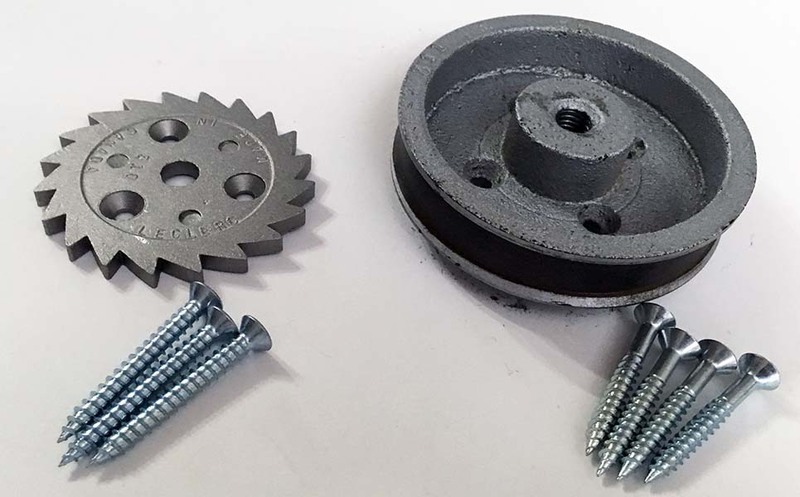 The brake drum has a large hole threaded for a bolt which goes through the frame so the Loom Crank Handle can attach to it. The ratchet wheel has a smooth hole that a metal axle fits through. Note: Complete Cloth and Warp Beams for Leclerc Table Looms are also available. Please contact us for pricing. There are two basic Warp Beam brake systems used on a majority of Leclerc floor looms over the years. The current design is shown below to the left and the older design is shown below right. Parts for these as well as other versions are available. If the brake system on your Leclerc loom appears to be different, contact us and we will help you determine which parts you need. 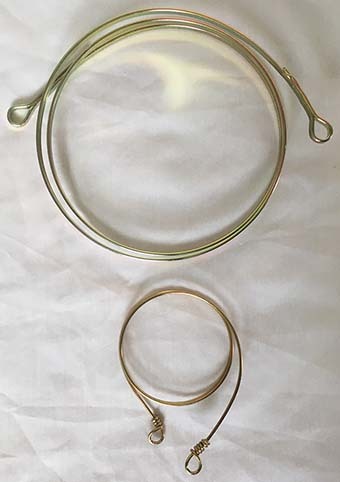 Note that the Brake Circle for both of these systems is the same and is shown below and replacement Brake Cords used by some brake systems are also available. Note that we can also provide conversion kits for very old Leclerc floor looms that use the ratchet and tension band system. Ordering information is shown below. Note: Some older Mira looms had an alternate brake configuration that used a cord plus the nylon pulley shown above. These S-Hooks are used to connect the Brake Circle, Brake Cord and Brake Spring to the Brake Lever on Leclerc weaving looms. Multiple S-hooks can also be used to lengthen parts of the brake mechanism that are held to tight in older Leclerc looms. Early Leclerc Fanny, Mira and Nilus floor looms were designed with a very different braking system than what is found on current models. 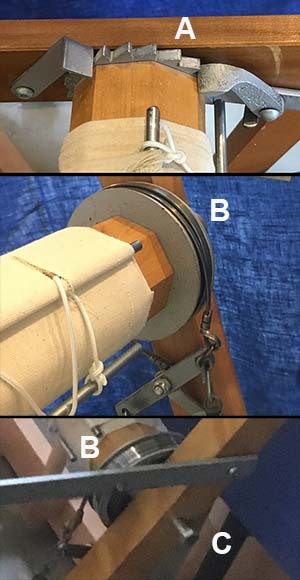 A ratchet mechanism on the right side of the warp beam worked with an independent slip band tension control on the left side. To convert an older loom to the current design, we have put together a kit with all the pieces required (pictured above left). The kit includes new beam ends, the brake system, the wooden lever, all screws and bolts and even the brake locking catch. A full set of diagrams showing where holes are to be drilled in the frame to install the parts is also included. The pictures to the left show the old braking system while the new brake after conversion is shown to the right. Click on any of the pictures to see a larger version. 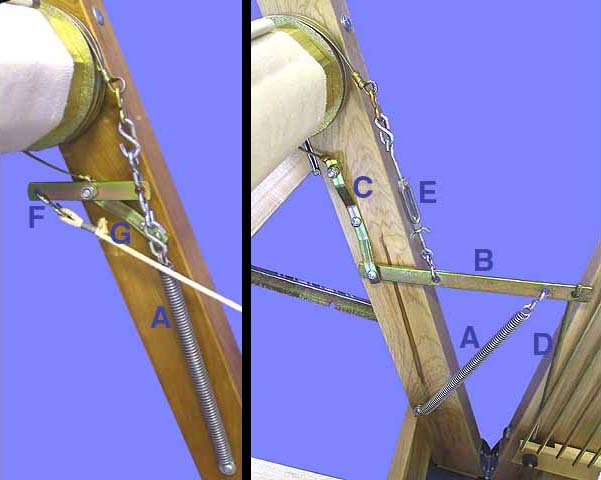 Early Dorothy, Meco and Medico table looms had ratchet brakes like the one pictured left at the top instead of the friction brakes used on the current Dorothy and 24 inch Voyageur. 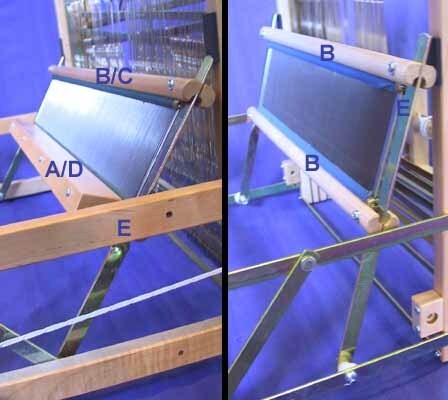 The friction brake design allows the weaver to easily engage and release the warp beam brake using a lever on the right side of the frame without reaching all the way to the back of the loom. The replacement support post is a different length for 15 3/4" and 22"/24" table looms so separate part numbers are shown. 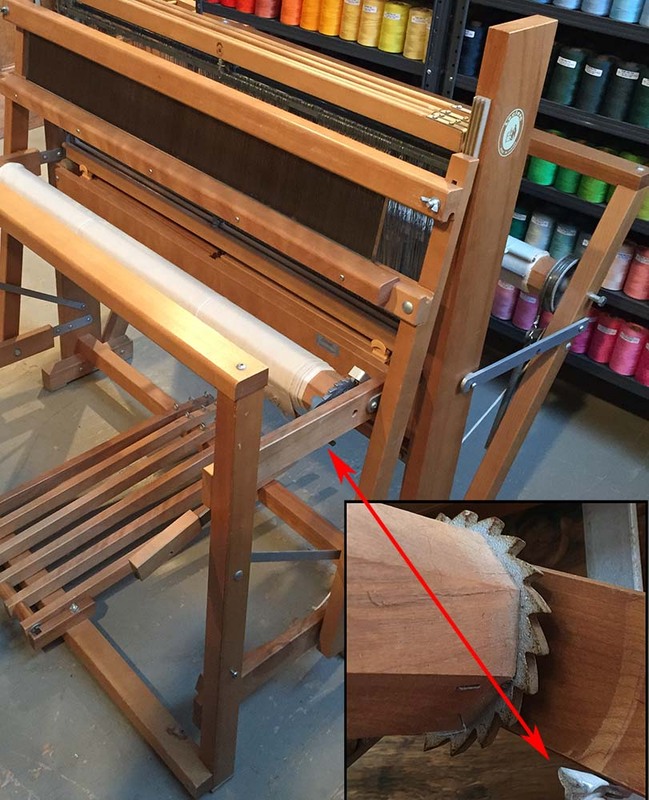 The normal kit includes a crank (wooden handle) to replace the one on the loom in case it's threads are damaged and won't screw into the brake drum. We have created an optional kit without any crank handle (pictured below) and another with 2 crank handles in case both the warp beam and the cloth beam cranks need to be replaced. Note that the upgraded brake design has changed from the picture shown. To see what the new brake looks like and what is required to install it, review the Installation Instructions. The Compact loom tension brake has been improved to make it easier to use and to provide better braking power. The brake lever has been lengthened and the spring tension is now adjustable. The brake coil has been replaced with a cable and to keep it from becoming unraveled when the brake is released a stopper limits the brake lever movement. As a result, only a slight pressure on the brake foot control is needed to release the brake and when it is engaged it provides an increased braking ability. These flat metal brake circles wrap around the brake drum on Leclerc looms to provide tension on the warp. The friction effect of the brake is released by pushing down on the brake lever. There are two sizes of brake circle. The smaller fits table looms like the Dorothy, Medico and Meco as well as the Minerva and older Compact looms while the larger fits floor looms like the Fanny, Mira, Nilus, Nilus II, Artisat and Colonial. Note: Older Leclerc table looms (Dorothy, Meco, Medico, Minerva) used a wire brake circle. This have been replaced with the solid small brake circle shown which is constructed using a flat metal surface like the large brake circle. This will result in improved performance due to the large contact area of this new brake circle. This spring exerts tension on the brake circle of the Meco, Medico and/or Dorothy looms when the brake lever is engaged. One end attaches to the brake circle and the other attaches to the nylon brake cord (or wire on older looms). 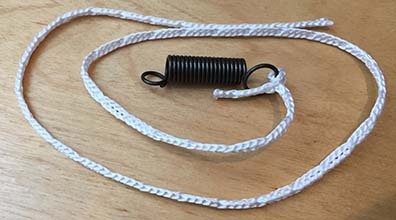 The new design on table looms is to use a section of large Texsolv Loop Cord to connect the spring to the brake lever. This allows easy adjustment of the cord length to get the brake tension correct. A cord for 4 shaft looms is provided but if the loom has a longer frame for 8, 12 or 16 shafts a longer cord may be required. This spring exerts tension on the brake circle of the Minerva loom when the brake lever is not engaged. One end of the spring attaches to the brake lever and the other attaches to the loom frame. Note: This brake spring is specifically designed for the Minerva loom and will not work on any other model of Leclerc floor loom. The spring may be longer than the spring on some early Minerva looms requiring a new lower mounting hole in the frame to be drilled. The Minerva is pictured here. For most Leclerc Floor looms the brake spring is shown in the Floor Loom Brake Parts section. 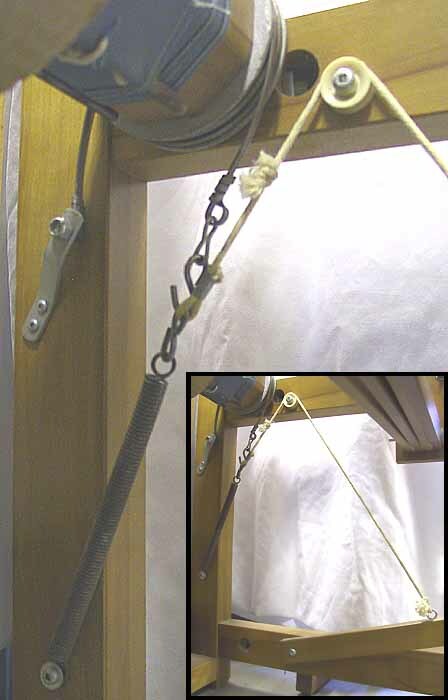 This metal locking catch is used on Leclerc floor looms to hold the wooden brake handle down. On most looms this catch holds the brake handle in a position that releases the brake allowing the warp beam to turn as the cloth is being advanced. This newer steel catch is much more durable than the older plastic version which tends to break after a certain amount of use. 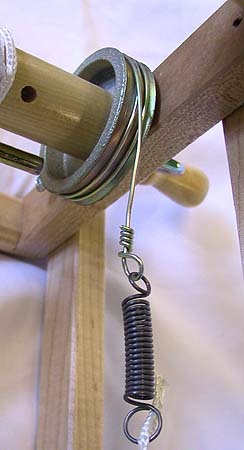 The wood screw used to attach the catch to the loom frame is included. Note: Parts may require the special square end screwdriver to remove the old part. Please ensure you have these tools before ordering to avoid installation problems. This kit adds the Warp Beam Advance Control found on the new Dorothy v2 looms to older 24" Dorothy Looms. 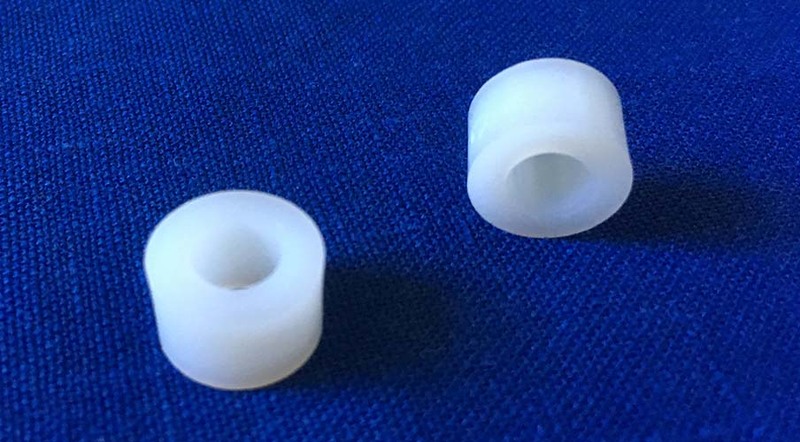 It includes the nylon controller screw plus a threaded insert. A 15/32 inch drill bit and drill are required to drill a hole in the vertical support post on the Dorothy Loom to install the insert. This Warp Advance Control system eliminates excessive warp yarn advance when releasing the brake system during cloth advance. This friction system is adjustable and has to be released when winding the warp on. The weaver just screws the wing nut with nylon bolt to the left back post. Screw the wingnut in to increase the friction or unscrew it to decrease/release it! These spacers are used in Leclerc table looms like the Dorothy to keep the levers properly positioned at the top of the castle as well as to provide spacing between the support brackets and the beater swords where they attach to the frame at the bottom of the loom. They are sold in pairs. The take up motion handle shown to the left is used on almost all the Leclerc floor looms except for the Compact, Artisat and Minerva which use a different type that is not shown. 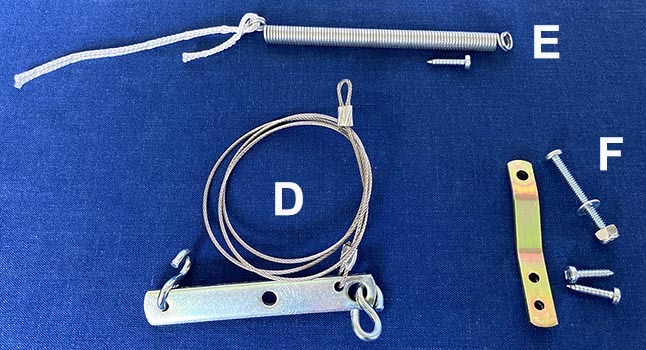 The Take-up handle (A) comes complete as shown with the small Pawl (B) which is also used as the ratchet mechanism on the Dorothy and Voyageur table looms. These parts can be used to rebuild the beater mechanism on the current 15 3/4" and 24" Dorothy, Voyageur and Diana looms. Contact us for pricing for similar parts for earlier versions (slightly different widths) of the Dorothy as well as for the discontinued Meco or Medico table looms. Note: The sleys/handtrees below for the 15 3/4" looms are actually 18 3/16 inches long and for the 24" looms they are 26 1/6" long at the longest part. 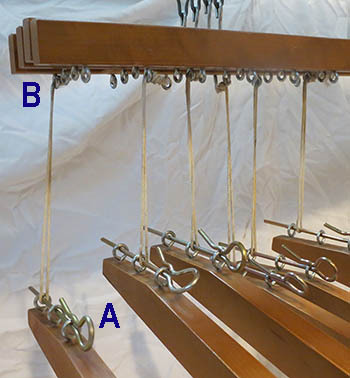 The small Screw Eyes (B) are installed in the bottom of the Lams and provide a place to attach the Treadle Cords. 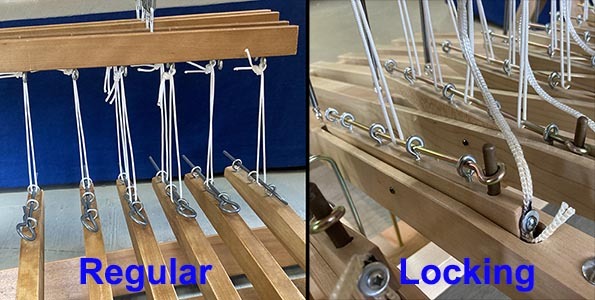 Each Lam should have one Screw Eye for each treadle although on some looms that are expandable there are enough for the total number of treadles that can be used on that loom. For many years Leclerc Looms were constructed using a special type of woodworking screws with square holes in the head. 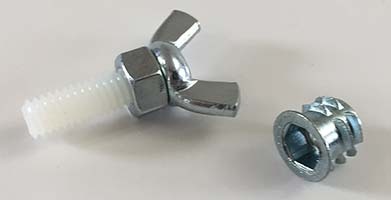 These "Square Head" screws are known as Robertson Screws, are not commonly found outside of Canada, and a special screwdriver was provided with the loom by Leclerc for assembly. This set of Robertson screwdrivers includes 2 sizes (large and small tip) to fit most screws on the wide range of Leclerc table and floor looms. (Note that the handle design may not be exactly as shown).